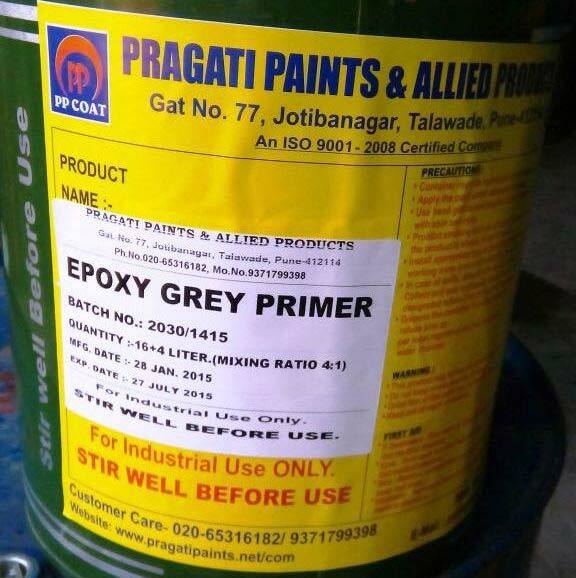 We are offering Epoxy Grey Primer. Description: a two component epoxy polyamide pigmented with durable pigments giving a matt finish. scope: a two pack epoxy high build coating with superb performance in severe marine & industrial environment. The product has excellent resistance to chemicals, solvents, fumes, splash & spillage. Can be used in various industries including refineries, fertilizers & other chemical plants. Drying time: surface temp touch dry hard dry overcoating interval minimum maximum pot life 15c 2 hours 12 hours 24 hours 10 days 12 hours 25c 50-55 min 6 hours 16 hours 6 days 6 hours 35c 30 min 4 hours 8 hours 4 days 4 hours specific gravity: 1.28 volume solids: 50 thinner clean up: pragati make epoxy thinner flash point: 30c pack size: 51020 liters application: stir base thoroughly & then mix 4 parts of base & 1 part of catalyst by volume to uniform consistency. Allow the mixture to mature for 30 minutes & stir again before application & during use. Brush roller: add up to 5% thinner if required during application. Conventional spray: add up to 15% thinner depending on conditions. Use only standard equipment at an atomizing pressure of 3.5-4.9 kgcm2. Airless spray: apply preferably without thinning. However up to 5% thinner may be added if absolutely essential depending on conditions. Use any standard equipment having pump ratio 30:1. Tip size 0.38-0.43mm.tip pressure 110-160 kgcm2 . Surface preparation: remove grease, oil & other contaminants preferably by using degreasing solvent. Blast clean to a minimum of sa2 ½ swedish std sis 05 5900. For severe corrosion, blast to sa 3 with a surface profile not exceeding 65 microns. The surface should be clean & dry before application of primer coat. Storage: up to 6 month in intact condition or sealed the containers are kept under cover in a dry place under normal temp.conditions.